Thank you so much for helping us continue to rescue abandoned rabbits and find new forever homes for them as house rabbits. NTRS now accepts online donations. Use any of the following secure links to donate to NTRS. As a registered 501(c)(3) non-profit organization, we operate on a severely limited budget of donations from the public. Your contributions of money, time, and resources are greatly needed. Veterinary costs comprise the bulk of our expenses. Spays and neuters are required for rabbit adoptions, and must be paid in advance by us. Treatment of ill or injured animals is also of primary concern. Food (fresh vegetables, timothy hay, and pellets), litter, housing essentials, and miscellaneous expenses dig into our pockets as well. 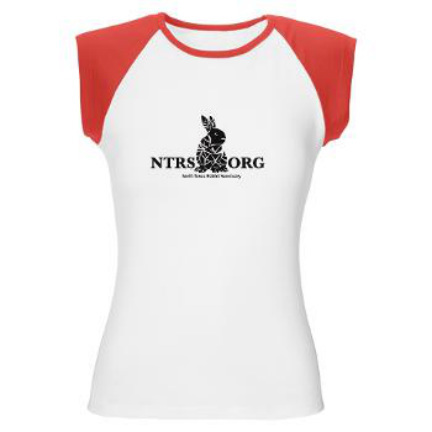 Another Design Made Exclusively for NTRS! ​Long and short sleeved t-shirts, hoodies, and tank tops are available in different sizes and colors. By simply presenting this letter one time to your Kroger cashier, your Kroger customer card will be linked to the North Texas Rabbit Sanctuary. All your future purchases will mean a donation to the rescue at no extra cost to you! Every time you use your Tom Thumb Reward Card, Tom Thumb will donate a percentage of your account total to NTRS, so be sure to use your card when you shop! Be sure to link our charity number to your Reward Card. To link your card, please complete this short and easy form and return it to Tom Thumb's courtesy desk. NTRS's charity number is 6876. Search the web with GoodSearch and each time you do a search, GoodSearch will donate about a penny to NTRS! Shop online at GoodShop and a percentage of each purchase will be donated to NTRS! More than 600 top stores are participating including Amazon, Target, Staples, Best Buy and more! Help NTRS by visiting your favorite restaurants! Join GoodDining for free and dine to earn up to 6% for NTRS. Donate your old car to Charity Motors and designate the "North Texas Rabbit Sanctuary" as your charity of choice. Charity Motors guarantees you the full fair-market value tax deduction for your vehicle at the time you donate it. Charity Motors will sell your vehicle and the proceeds will benefit NTRS. By donating your old vehicle instead of selling, you may actually make more money. Remember all charitable donations are tax deductible and the deduction may be worth more than the car. It also saves you the hassle of having to sell, advertise, etc.